The Perot Museum's TECH Truck trebuchet in action. Science students launched apples, tangerines and tomatoes. One apple ended up 117 feet downfield. Dallas’ Perot Museum of Nature and Science just launched its second TECH Truck. Designed to take science to the streets, the truck recently visited southern Dallas on the campus of UNT Dallas. Middle school girls in a Girls Inc. summer science program are assembling pre-cut wood using nuts bolts and screws. They’re getting help from the Perot Museum’s TECH Truck educator, Michael Hughes. “We built a … treb … boo … a trebuchet …” says one of the middle school kids, speaking slowly and carefully. Most of these 13-year-olds don’t know what a trebuchet is. Most adults don’t know either. So Hughes describes it. It’s kind of like a catapult. With their contraption assembled, the students carry their trebuchets outside to put them to the test. They launch fruits and vegetables. “When I get to one, step back. Three, two, one,” Hughes announces. After a few failed attempts, an apple flies. “Oohhh. Yeah, whew!” the kids exclaim. The winning team’s apple landed 117 feet away. The TECH truck has been delivering science lessons to North Texas neighborhoods since last fall. A second truck starting hitting the road this summer. By the end of August, the trucks should reach 22,000 students, many in low-income communities where kids and families might not be able to afford or make it to the Perot Museum in downtown Dallas. 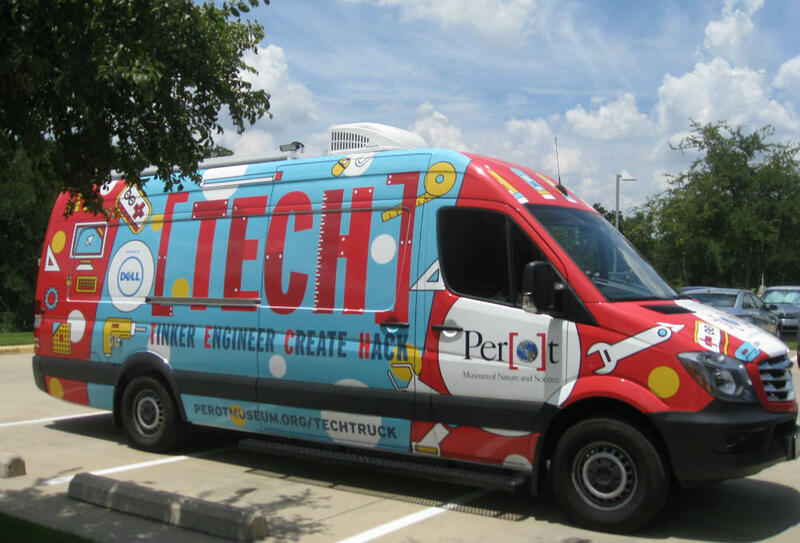 The Perot Museum of Nature and Science launched its second TECH Truck in June. It's equipped with many of the same gadgets as the first truck, christened last fall. The new one, though, has added a solar panel to the roof. Back at the UNT Dallas summer camp, Zamantha Romero and Tenaiya Sanders are having fun with their trebuchets. “It was cool, basically because we got to build it, we got to really see how it works. We got to work as a team. We got to know each other more,” Zamantha says. Collaborating to be creative is a point of the TECH Truck, says Teresa Lenling, the Perot Museum’s director of public programs. “That’s what this type of programming is going to do, is for youth to really look at projects in a different way and understand who’s going to do what within a team and really work on the project as a whole,” Lenling says. 14-year-old Dasia Edwards, heading into ninth, grade, got hooked discovering bacteria in all sorts of places. 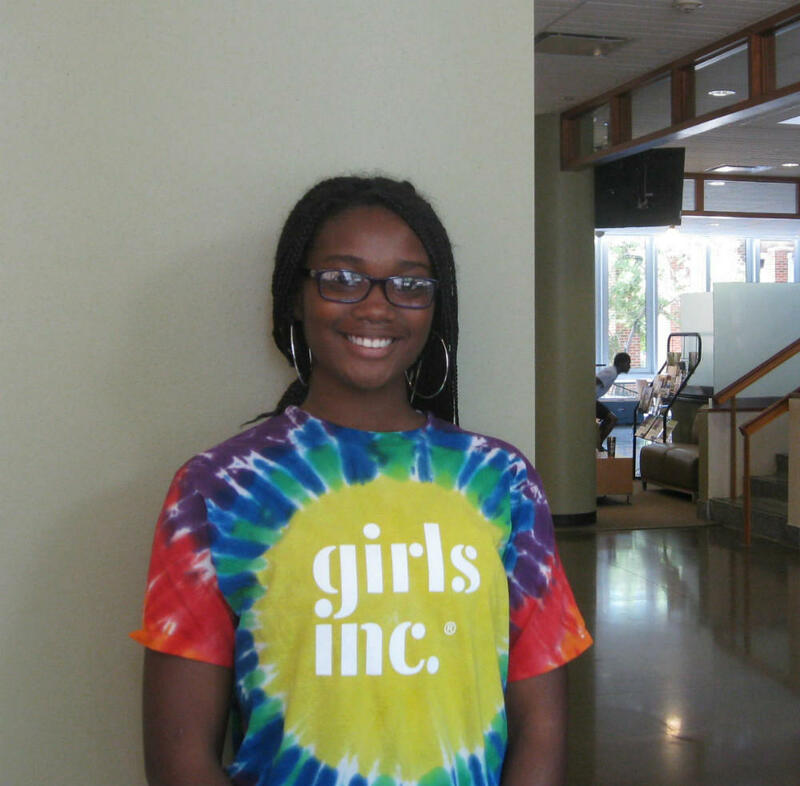 “And it was amazing because there was more bacteria on a cellphone screen than the boys’ bathroom,” Dasia says. Dasia Edwards launched a tomato from the trebuchet she helped build. Standing in a UNT Dallas building, she's in the second year of a five-year summer science program run by the nonprofit Girls Inc.
Ratna Narayan, UNT Dallas’ science instructor, runs the summer program here. She loves the Perot TECH Truck. The trebuchet contest was yes, about fun and team building. But Narayan said it was also about learning the really cool stuff: science. Thanks in part to a school on wheels. Correction: UNT Dallas was incorrectly described in an earlier version of this story. One major focus in the classroom is getting students ready for college or a career. These days, some of the hottest careers are in kitchens. One North Texas culinary college class is preparing future chefs. We’ll turn now to a follow-up of our American Graduate series “What’s Next for The Class Of ’17?” Earlier, we caught up with Ricky Rijos Jr., an 11th grader at Flower Mound High School. He’s a basketball fanatic – but he’s only 5’6”, and after sitting on the bench he says he’s giving up the sport. Fran Fraschilla can relate. He’s a former college coach, a current announcer for ESPN and the father of two boys who never reached 6 feet tall. Fraschilla, by the way, is all of 5’7”.